As governments meet in Berlin, scientists and farmers on the frontline ofclimate change in the Philippines are at odds over how best to adaptagriculture to the much higher temperatures and weather extremes expected over the next century. While one group argues that hi-tech rice varieties will withstand the greater floods, droughts and storms forecast this week by theIntergovernmental Panel on Climate Change (IPCC), others say small farmers can best respond by avoiding chemicals and addressing problems such as soil fertility and water shortages. In one corner is the International Rice Research Institute (IRRI) in Los Baños, funded with $96m (£58m) from the US and UK governments, as well as major organisations such as Kellogg’s and the Gates Foundation. There, with help from the Rockefeller and Ford foundations, scientists in the 1960s crossed rice varieties and, by using herbicides and inorganic fertilisers, more than doubled rice yields. The Asian “green revolution” was born, even as the continent was experiencing serious food shortages, and the Los Baños scientists were credited with pulling the region back from the edge of famine. Today IRRI sees climate change as the greatest challenge in 50 years. Temperatures at the research station have risen 2-4C in 40 years, yields are below 1982 levels and minimum temperatures are rising. If the IPCC scientists are correct, yields may fall a further 25% over the next 40 years, potentially triggering the greatest food crisis the world has seen. “The challenge when IRRI was set up was to grow more rice and to avert hunger,” says the institute’s deputy director general, Bruce Tolentino. His office occupies the old laboratory where on 29 November 1966, where the first strain of IR8 “miracle” rice was developed by crossing a Chinese dwarf, Dee-geo-woo-gen, with Peta, a tall variety from Indonesia. Climate change, says Tolentino, needs a new green revolution: “The challenge now is to rapidly adapt farming with modern varieties to climate change and feed a fast-growing global population, half of which depends on rice as a staple food. One billion people go hungry every day. 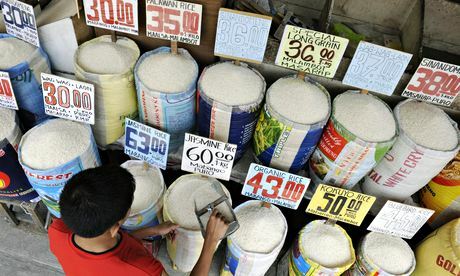 “In the 1990s rice yields were growing 2% a year; now they are just 1%. We are unable to keep up with population growth. Temperatures have risen 2-4C. Climate change will reduce productivity. Rainfall is unpredictable and rice is grown in areas like deltas that are prone to sea level rises. We have to gear up for more challenging agro-ecological conditions, we need to be able to use swampy areas and develop varieties that can be grown in salty or flooded areas. We have already launched flood-tolerant rice and we are now introducing salt-tolerant varieties,” he says. “The results [of IRRI work] are staggering,” says Abdelbagi Ismail, the Sudanese principal scientist who helped develop scuba rice, which can survive flooding for 17 days. He and others crossed a flood-tolerant variety traditionally grown by poor farmers in Orissa state, India, with a more high-yielding variety widely grown across Asia. Using marker-assisted gene tracing, but not genetic modification, the scuba rice plant becomes dormant in waters up to 1.5 metres deep and starts growing again only when the floodwater recedes. Drought, salt and more flood-tolerant varieties developed with conventional plant-breeding techniques are being tested at Los Baños, but within a few years GM varieties modified to synthesize betacarotene, a precursor of vitamin A, and others that will contain added iron and zinc may be available. IRRI is also working on an all-purpose GM rice variety that should be able to withstand flooding, drought and salinity. But the holy grail at Los Baños, what some scientists call a game-changer is genetically modified C4 rice, which would mimic maize and a few other crops by using photosynthesis far more efficiently. An international group of scientists, funded by Gates and the UK government to the tune of about $27m a year, is several years into a 20-year C4 programme, but no date is given as to when it might be ready. “If we managed to re-engineer C4 rice it could give yields 30-50% greater yields,” says Tolentino. Even as IRRI scientists race to develop climate-ready rice to solve future hunger, thousands of small farmers, who make up 60% of the population of the Philippines, say they are not waiting for hi-tech science but are adapting to climate change in other ways. The high-yielding seeds promised by the green revolution have not helped small farmers get out of poverty, they say. Instead they have gone deeply into debt to pay for chemicals and seeds on the promise of higher yields and better markets. Instead, climate change, in the form of erratic seasons and intense rains, has often ruined crops while middlemen have offered them the lowest prices. “We take loan for the seeds, and we pay upon harvest. We are usually left with empty sacks. So we take out loans for food and family expenses, and inputs to be able to plant for the next season. Upon harvest, we have leftover debt,” says a man in a film produced by the Farmer Scientist Partnership for Development, or Masipag, a network of 630 farmers’ groups, scientists and Filipinos. Masipag president Chito Medina says IRRI does not look at sustainability. “Scientists in IRRI are hi-tech scientists, thus you would expect hi-tech farming as their solutions,” he adds. “They are highly specialised but this strength is also their weakness when their specialised knowledge is applied to farming, which is a complex system.” In the real world of farming in developing countries such as the Philippines, he says, decisions are made not just according to seed types but depending on soil types, water availability, the presence of pests, the financial ability to buy inputs and issues such as land ownership. Since 1986, Masipag farmers have collected 1,300 traditional rice varieties, about 28% of the original traditional rice varieties before the green revolution. Hundreds now breed rice on their own farms and together have identified 18 drought tolerant rice varieties, 12 flood tolerant, 20 salt water tolerant, and 23 pest and disease resistant rice varieties. They are rejecting chemicals and using alternative growing methods such as the system of rice intensification (SRI), which aims to increase yields by stimulating the roots of plants. It has been found to increase yields by 20-100% in many countries including India, Cambodia and Vietnam. “The flood-tolerant, drought-tolerant varieties developed by IRRI require a high amount of input of chemical fertiliser and pesticides that are not affordable by the majority of poor farmers. Methods like SRI and organic farming are attractive because they are available and affordable and give a better net income. The yield of organic farms and chemical farms are not significantly different but the net income of our organic farmers is significantly higher than chemical farming in the Philippines,” he says. Seeds are just one resource, and IRRI is not looking at others, say farmers in Mindanao and Luzon, who are also turning to organic farming. “We get higher yields, have lower production costs, higher biodiversity and therefore better food supplies with SRI,” said a farmer at a Met Office event for weather prediction training with Oxfam, last week. The two different approaches to farming, of cutting-edge science and low-tech sustainable farming, have produced inevitable tensions and mutual distrust, not helped when last year Filipino farmers, including members of groups linked to Masipag, destroyed a GM trial at IRRI. Each group now throws doubt on the other. “SRI is a package. When you break it down it has to do with selecting the right sees applying varying levels of nutrients. It’s best practice. We hesitate to label it SRI because each farmer has their own approach. Some of the results have been remarkable in small, controlled plots but not on a wide scale. There have been some outlandish claims but a lot are anecdotes,” says Tolentino.